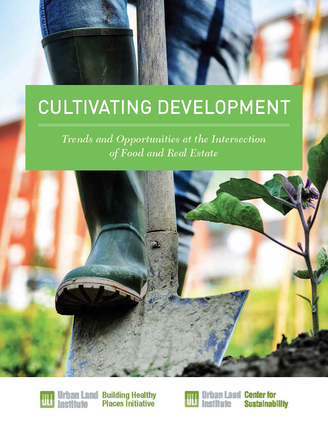 Cultivating Development: Trends and Opportunities at the Intersection of Food and Real Estate highlights opportunities and partnerships essential to the success of real estate projects that include food as a development focus. Throughout the United States, developers are exploring the mutually beneficial relationship between food-based amenities – such as working farms, community gardens, food halls, restaurants, and grocery stores – and real estate. By moving beyond the standard development models and working with food-based businesses and partners outside the "usual suspects," developers, owners, property managers, designers, investors, and others involved in real estate decision making are producing projects that benefit people and the planet while also maximizing profits. Kathleen Carey, President and Chief Executive Officer, ULI Foundation, oversees all fundraising activities for ULI and the ULI Foundation, the Foundation's Annual Fund, the Foundation Governors program, ULI's work with philanthropic grantors and partners, its sponsorship efforts in support of ULI's global meetings, and the Institute's corporate partners program. She is also actively involved in the development of ULI's overall program of work. Carey previously served as ULI's Executive Vice President and Chief Content Officer, overseeing the research and programming produced by all of the Institute's centers and initiatives. She also supervised ULI's advisory services, real estate education, and awards programs. Prior to joining ULI's staff, Carey was a Senior Vice President at GE Capital Real Estate, including ten years of service as the global leader of its Six Sigma initiative, the highly regarded business strategy for process improvement and project management. She was a ULI member for more than seven years, including service as a council member on the Urban Development Mixed Use Council. She also is the founding member and inaugural chair of ULI's Women's Leadership Initiative, which seeks to raise the number and visibility of women in the real estate industry. Rachel MacCleery is Senior Vice President at the Urban Land Institute, where she leads the organization's Building Healthy Places Initiative, as well as its Infrastructure Initiative. Under Building Healthy Places, Rachel is spearheading ULI's efforts to leverage the power of ULI's global networks to shape projects and places in ways that improve the health of people and communities. Rachel's Infrastructure Initiative portfolio encompasses a multi-faceted program of work promoting better and more sustainability infrastructure decision making. Rachel is a frequent speaker and writer on infrastructure topics. Rachel has both local and international experience, and began her career as a transportation planner for the city of Washington, D.C. Rachel consulted on infrastructure and planning projects in China while working for global infrastructure provider AECOM from 2004 to 2008. Rachel speaks Mandarin Chinese and holds master's degrees in public affairs and urban and regional planning from the Woodrow Wilson School at Princeton University. Sarene Marshall is Executive Director of the Urban Land Institute's Center for Sustainability. In this role, she oversees ULI's activities in the areas of climate change, energy, sustainability, and resilience, including the Greenprint Center for Building Performance and ULI's Urban Resilience Program. Sarene came to ULI from The Nature Conservancy. As a Senior Advisor at TNC, she addressed the Conservancy's own environmental footprint by managing carbon, waste, water, and recycling. She also helped develop new initiatives on food security, water security, and smart infrastructure in Latin America. Previously, Sarene served as Managing Director for TNC's global Climate Change program and led change management, globalization and strategic planning projects on behalf of TNC's executive team. Matthew Norris, Senior Associate, Content at the Urban Land Institute, supports the Institute's Building Healthy Places Initiative and works on projects linking health, sustainability and development. He previously worked at the Tri-State Transportation Campaign where he focused on improving access to safe, reliable and equitable modes of transportation throughout southern New Jersey and the Greater Philadelphia area. Matt earned his Master's in City and Regional Planning from Rutgers University-New Brunswick in 2010, where he focused on international development and comprehensive planning. Matt also holds a B.A. in Sociology from the University of Kansas.